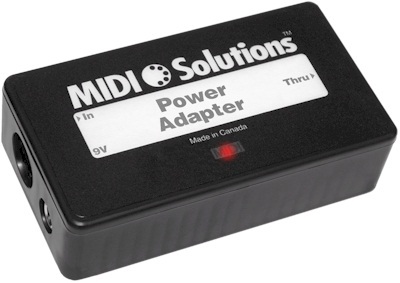 The Power Adapter provides power to MIDI Solutions products in instances when it is not available or where a large number of MIDI Solutions products are being chained in series (see FAQs - LED). It's possible to power up to 20 MIDI Solutions products from the Power Adapter's single MIDI Thru output. The Power Adapter has an optically isolated MIDI In, a MIDI Thru, and a power connection for a 9V wall adapter (a 9VAC wall adapter is included with North American orders, international customers can use any 9V wall adapter with standard 2.1 mm barrel connector, AC or DC, any polarity, minimum 50 mA rating). The Power Adapter is a Special Function Product and not part of our main product line - please contact us directly at sales@midisolutions.com to order.